Nolan is one of Australia's most respected and internationally celebrated painters having travelled and exhibited extensively throughout the world during his long career. Largely self-taught by way of repeated visits to the State Library and Gino Nibbi's legendary book store in Melbourne, Nolan discovered the art of Miró, Klee and Picasso and immersed himself in the writings of Blake, Rimbaud, Nietzsche, Kierkegaard and DH Lawrence. 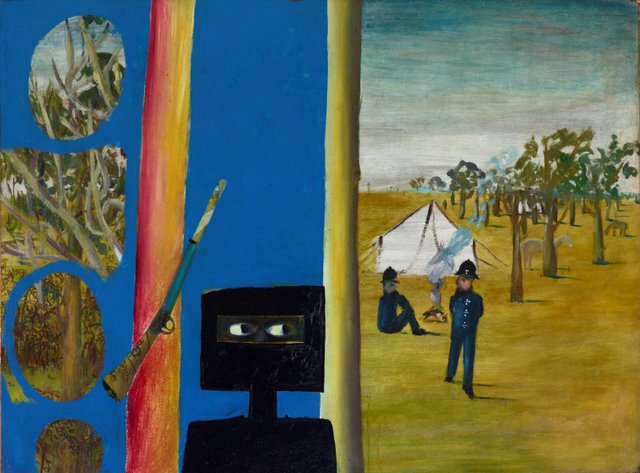 Ned Kelly was an Australian folk hero many decades before Nolan took up his cause. Nolan's fascination with Kelly developed from stories told by his grandfather, a trooper who had hunted down the fugitive bushranger in 1880. 'The camp' is one of the original, seminal series of works depicting the life and deeds of this antipodean bandit, which Nolan painted at Sunday and John Reed's house 'Heide', in 1946-47. 'The camp' refers to the moment in the story of Kelly's exploits, just before his gang's ambush at Stringybark Creek in rural Victoria, where three policemen sent to apprehend the outlaws were killed. The bold division of the painting into two halves creates a powerful psychological tension: the calm landscape to the right is juxtaposed against an electric-blue area of paint, from which emerges the square, black, silhouetted figure of Kelly, wearing his beaten-iron armour and helmet.